We often describe a custom staircase as a beautiful piece of furniture, enhancing the design of a home or commercial space. However, as a permanent feature, custom stair design is a complex process with many factors to consider. Understanding the process is key to ensuring the perfect fit while saving both time and money. First, what will fit within the space, and what does the building design allow? Building codes often dictate the aspects of the stairs design including tread depth, riser height, distance between landings, space between balusters, and handrail size and height, among others. Partnering with an experienced provider helps to balance your unique inspiration with building requirements. Through our proven three-step stair design process, outlined below, we provide guidance and support, leveraging our expertise to ensure a streamlined process for our customers. During the planning phase of stair design, our experts perform a multi-step process known as value engineering. An integral part of residential and commercial design, value engineering maximizes the project while minimizing costs. Our team works collaboratively with architects and general contractors to identify key specifications of the stairs design in the project. Then, we offer alternative design solutions to maximize value and ensure the project meets budgetary constraints. Is this staircase designed to make a grand statement in the foyer of a home or commercial building? Is this a secondary stair, primarily used for function? Whether style or function is paramount, our team designs and constructs staircases that are safe, durable, and well-suited to their spaces. 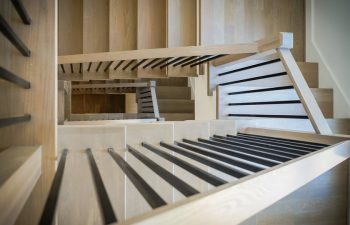 What is the stair design style and how does it fit? Does the space allow for a curved or straight stair? Are you looking for a grand design, an interior statement? When designed with careful skill and expertise, a staircase can bring just the right amount of charm to a residential or commercial space. However, inspiration can require technical tweaks, and these adjustments need to be made early in the planning phase to prevent loss of time and money. For example, a homeowner may desire a grand, curved stair, when the home’s layout only allows room for a straight stair with one or more landings. Can the plans be altered to accommodate these wishes? Our team specializes in custom stairs, and we leverage our industry knowledge and technical expertise to ensure that the stair design is a perfect fit for the space, and will provide both style and function for years to come. With so many elements to consider, custom stair designs can be a complex and overwhelming process. Consider partnering with our team to ensure your custom stair project is a perfect fit in terms of space, style, and budget. Visit our commercial and residential project galleries for additional details and pictures on our exquisite projects. From inspiration to installation our team is committed to designing and building the highest quality custom staircases. Our reputation speaks for itself and client satisfaction is our highest priority. Contact us today to discuss your next stairs design project.